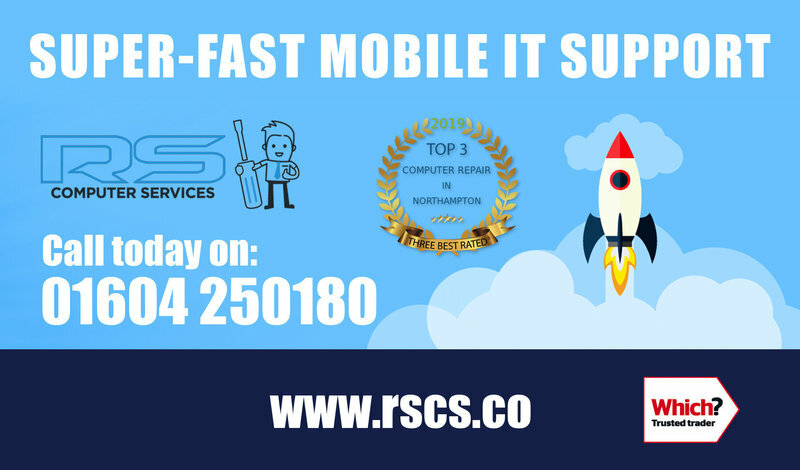 We have been serving the IT needs of the people in/around Northampton for over 20 years. We’ve developed a reputation as knowledgeable and honest PC repair specialists. Many of our customers come back to us time and again because they know their computer problem will be fixed by someone they know and trust. -Great reputation built up over 20 years. -Huge customer base of loyal, happy customers. -Outstanding technical knowledge built on hands-on experience. Fixed and clearly displayed pricing. 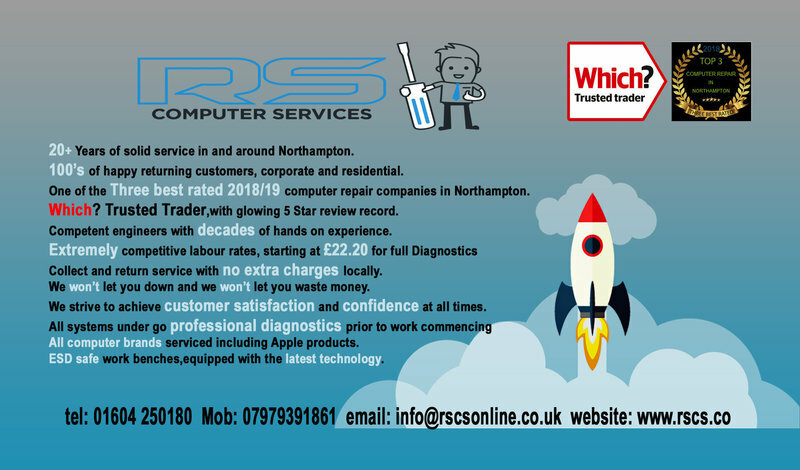 Contact us, we will respond during office hours, we fix our prices so everyone knows where they stand before our services begin, labour and call out charges range from £22.20, £36.00 and £58.80 Our standard Diagnostics charge is just £22.20p and for this we will travel to you and carry out our fault diagnostics in your presence, diagnostics charges are not applied if you chose to continue with a repair service. We also book appointments outside of regular hours. An excellent and friendly service. Everything was fully explained, it's great to have found a decent computer repairer at last! Thank you. Thank you for the first class review, I'm glad to have been of help. Absolutely fantastic service! Couldn't recommend RSCS enough. I'm not sure where to start with this review as every part of the service was outstanding! I made the fatal error of buying a refurbished MacBook Pro online for it to completely conk out on me 6-months later! I got in touch with Rowland at RSCS after a recommendation and, considering my tainted past of dealing with cowboys, approached with caution. I was worried about leaving my expensive laptop with someone I didn't know. However, upon meeting Rowland I immediately knew I was dealing with the right guy. 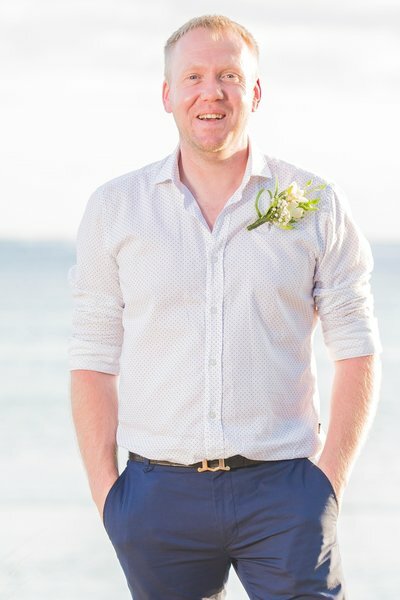 Not only is Rowland a friendly, trustworthy guy but he's also a highly skilled electrician, passionate about his work and customers. His work is of outstanding quality, he has an acute eye for detail and troubleshooting, and he knows more about motherboards/electronics than anyone I've ever met. 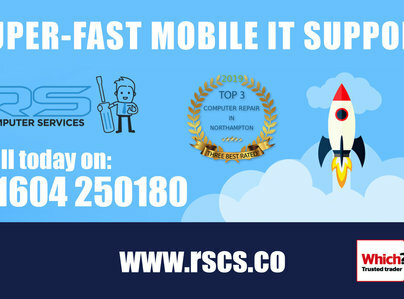 RSCS is a professional IT service of the highest standards. 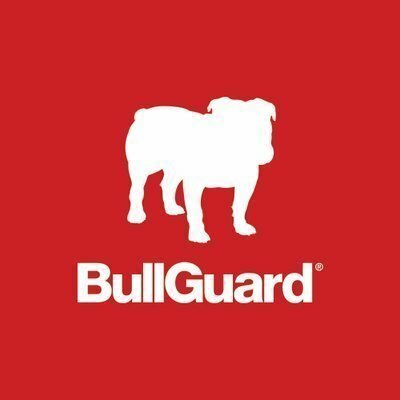 I'll never use any other company going forward. It was a pleasure Grant, Thanks for choosing my services. An excellent service. Responsive and very professional. Explained costs, these never varied. Assured everything was working correctly. Never felt rushed. Could not fault service. Thanks for the excellent review Julia, and thank you for choosing our services. Friendly, fast & efficient service. A very friendly, fast and efficient service. Explained the problem clearly and in lay terms. Will definitely recommend his services to others. Very pleased. Thank you John, it was a pleasure to meet you. Roland was clear in his instructions, did an excellent job in reconnecting our iPad to the internet & cleaning up my laptop. Did not use jargon we could not understand & his customer service is second to none. A very nice person & a privilege to do business with. Will most certainly recommend him to anyone else. Thank you for the "first Class" review Jennifer, i hope all runs well for you. After what was most likely a quick commission based sale at a high street computing shop, the laptop I had spent hundreds of pounds on was so slow and unresponsive! I contacted RS Computer Services and within 5 minutes of talking I already knew I’d called the right place. Rowland was flexible with my working hours, he gave me options and didn’t tell me I had to spend hundreds more to fix the problem. He has a very efficient home office located in Northamptonshire and worked tirelessly at all hours to get my laptop back to me with a quick time turn around. Great customer service provided and very cost efficient. 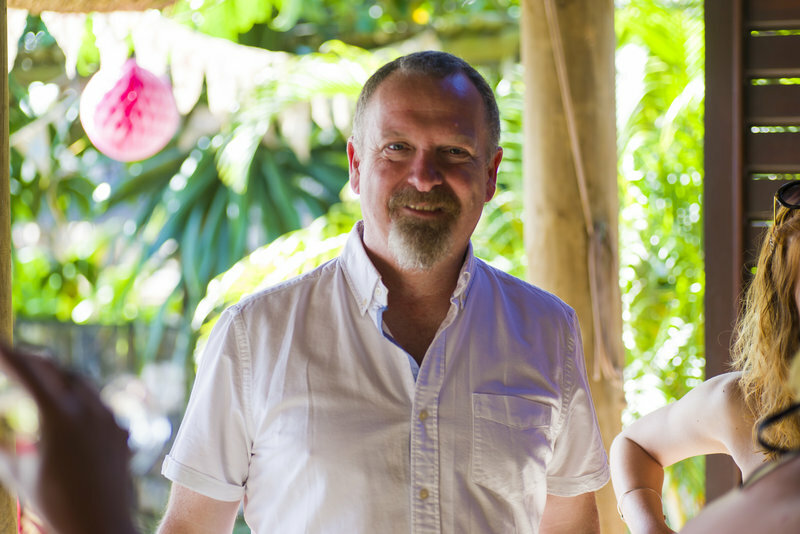 I felt like he went above and beyond for me and fixed my problem with a minimal cost effect. Would highly recommend!!! Thank you for taking the time to write a detailed review, Glad to have been of help. 5* service. Excellent customer service. Quick and reliable. I would highly recommend Roland and will definitely be using his services again. Thank you for choosing me to service your system, it was my pleasure and glad you was happy. Came to sort out my laptop. Did various checks. Was unable to correct my laptop and said my router was at fault. He very kindly phoned my provider and after some discussion was able to get my provider to send their engineer who came the next day. He was very patient and came across as a very helpful and knowledgeable man. It's all sorted now. Thank you. You're most welcome Evelyn, Thank you. It's been at least a couple years since my computer performed as it should hence, I decided to have it sorted. I found this service, made a call and the rest is now history. I can attest to the fact that the service received was fast, efficient, friendly, professional and the cost is so very reasonable it's almost unbelievable for all the work done. I'm also left with the peace of mind that I can call for support if I ever need it. Thank you for coming to my rescue. Thank you for the kind review of our services and costs, always a pleasure. Thank you David, glad to have been of help.